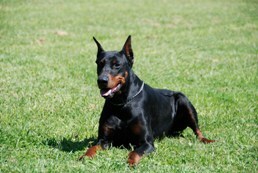 Von Forell has dedicated a life time to a constant global search for the Highest Quality Dobermanns. Although temperament is of paramount importance, Von Forell places equal importance on the health of the dogs chosen to continue the potent bloodline developed. 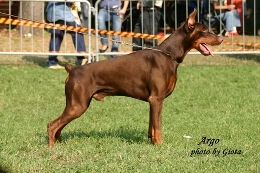 Through intensive research and development and a detailed understanding of the complexity of genetics Von Forell has managed to achieved a very unique and particular type of Dobermann. You will notice the striking physical characteristics, such as bone, substance dark pigment and functional conformation. Additionally the temperament is driven, uninhibited and mentally equipped to deal with modern mans world. It is important to know that Von Forell has not left a stone un-turned in a quest to find the finest Dobermanns with the correct genetics and biological expression. After many years of breeding and working with Dobermanns, Von Forell has achieved a proficient understanding of the global gene pool. This allows us the ability to identify certain bloodlines, individuals and combinations that produce particular types of character traits that will suit you best. We have separated them into the following three categories, so that you are able to choose the right puppy for your requirements. Please browse through the specific categories that suit your requirements and then feel free to contact us for a consultation to further discuss your new Von Forell Puppy. We would be grateful if you would complete this short profile- About You in order to help us establish how to best help you. One of our consultants will be in contact shortly, in the meantime should you prefer to speak to us personally please feel free to call. Alternatively you may download our Order form. This enables us to ensure you receive a puppy from the most appropriate litter and then the most suitable puppy within the litter. Our selection policy is based on compatibility and not on first order basis. By telephone, e-mail or at our facilities, our specialists will answer any questions whatever they may be, and guide you in your choice of products and services.